A United Nations expert has visited one of England's most deprived neighbourhoods, weeks after it was used in a US election advert. Prof Philip Alston went to Jaywick, near Clacton in Essex, as part of a two-week tour of the UK. A picture of Jaywick, also known as Jaywick Sands, was featured as a warning to voters in a campaign ad by Congressional candidate Nick Stella. His visit aims to examine causes of poverty in the country. The village, which is partly made up of a former holiday park, came top of the government's English deprivation index in 2010 and 2015. Prof Alston, the UN special rapporteur for extreme poverty, is on a fact-finding mission looking at the impact of changes to "social protection" in recent years, including the Universal Credit benefits system. Among those to tell their stories to Prof Alston was Trisha Faulkner, who told how she ended up with large debts. She told the BBC: "In 2013 lots of things went wrong with my life, I was working in the NHS and I got a back injury which basically was the start of me becoming disabled. "I was still working, had a beautiful house, was paying my rent. I ended up going through a divorce and as years went on my mobility was getting worse and worse, and now I have been registered disabled for the last two years. "I was trying using credit cards to pay my mortgage and paying for food." Tendring District Council chief executive Ian Davidson said: "Prof Alston's mandate is to look at a wide range of issues, including potential causes of poverty such as welfare reform. 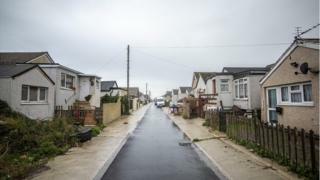 "What is interesting about Jaywick Sands is how the root cause of issues around deprivation stems back to poor quality homes and a shortage of housing post-Second World War, rather than anything more immediate." Essex County Council has spent £6.5m on improving roads and drainage in Jaywick since 2015.